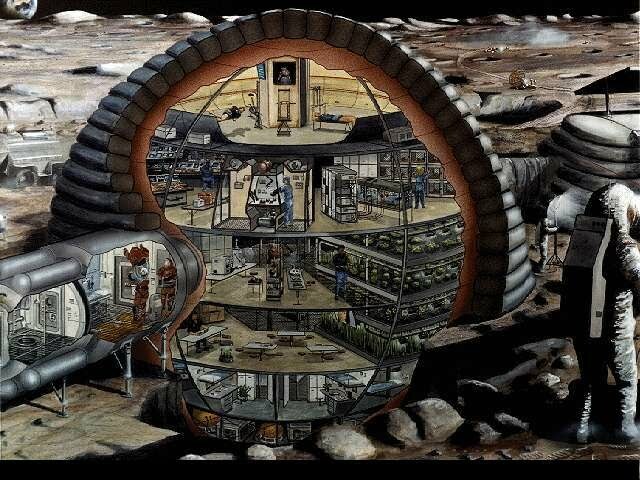 Cutaway drawing of the lunar habitation module. 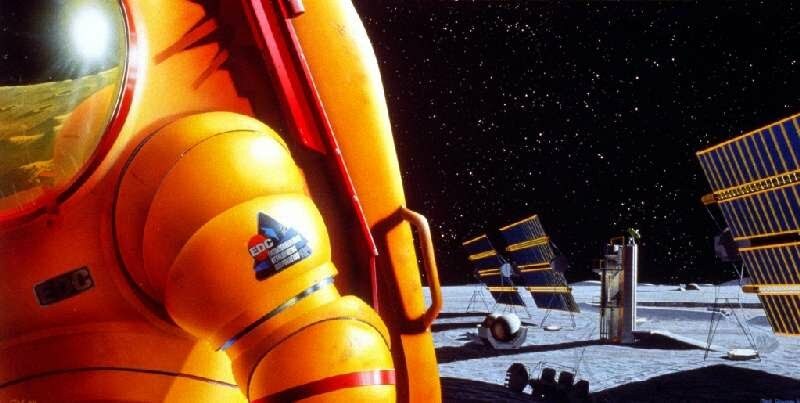 NASA/Johnson performed a number of extensive lunar outpost studies in 1986-89 which served as a basis for the 90-day Study report in November 1989. This document summarizes Reference Approach A of the report, which assumed the first 30-day manned mission would take place in 2001 after the first two cargo missions in 1999-2000. Four astronauts would work and live inside the 4.45m diameter, 8.2m long "construction shack" habitation module. The large panel on top of the structure is a thermal radiator. The module is covered with bag-like lunar soil containers to protect the crew from the lunar radiation environment. Deployment of a photovoltaic power supply. After the first manned visit, there would be two more unmanned cargo missions to emplace additional surface habitation, science equipment, a laboratory module and power facilities. After this, the second crew begins permanent occupancy on the outpost in early 2002 with a 6-month stay. 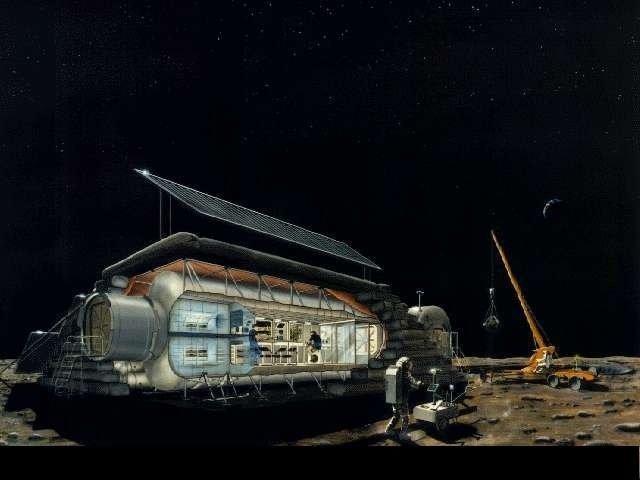 The early lunar outpost would require 100KW of electricity, which initially would be provided by 2000 square meters of solar cells. The box-like structures contain regenerative fuel cells, which are required to provide power during the 14-day long lunar night. Lunar Excursion Vehicle approaching the lunar outpost landing site. The third manned mission in mid-2002 represents the beginning of reusable Lunar Excursion Vehicle operation. This crew will spend 12 months on the Moon. 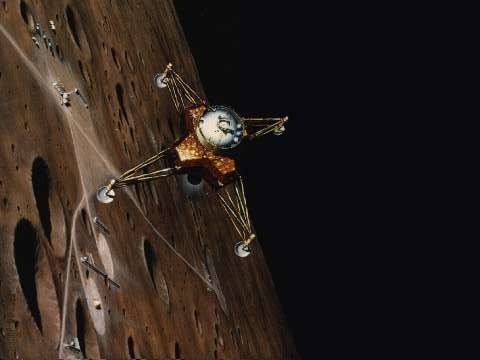 All flights until now have involved expendable LEVs and LTVs costing some $2 billion [1999 dollars] per mission but the addition of a Lunar Excursion Vehicle "servicer" will permit up to five LEV reuses, reducing the cost per flight to "only" $800 million including $75 million for new LTV propellant tanks and servicing. The Servicer provides power, thermal control, monitor vehicle subsystems and permit cryogenic propellant boiloff while the LEV is parked on the lunar surface. LEVs, servicers and landing pads are located 2.5 kilometers from the outpost to minimize the impact from chemical contamination from rocket exhaust and reduce the potential for damage if a crash should occur. Constructible lunar habitat. The next major expansion would take place in 2005, when a large inflatable "igloo" for eight lunar astronauts is added to the lunar outpost. 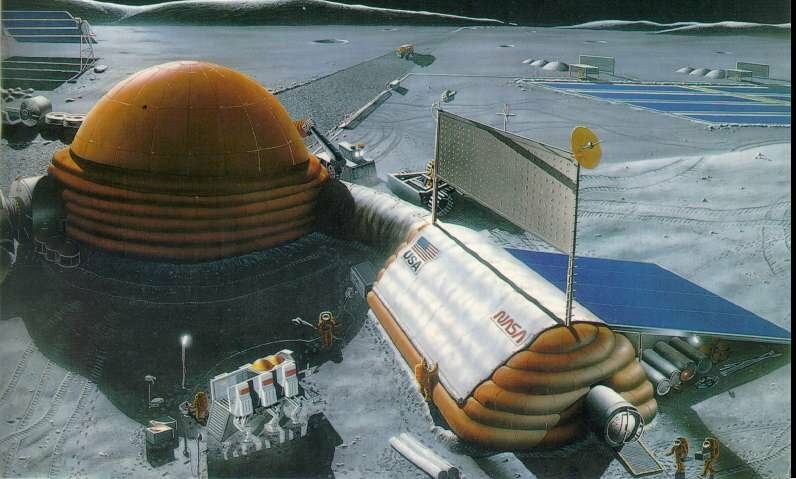 Before this, a small experimental lunar oxygen production facility would be added in 2003 (its solar power system is visible at top left). A small nuclear power unit would also be be added. The astronauts would focus on local local geologic and geophysical exploration within a few ten kilometers from the outpost. Arrays of astronomy telescopes and small unmanned geophysical & particle physics stations would also be added in 2003-2005. In 2006, the number of crewmembers expands to eight, consisting of two groups of four astronauts who serve 12-month tours of duty. Interior of constructible lunar habitat. The inflatable "igloo" has a diameter of 16 meters and provides four levels of living and working areas. At lower left is an airlock. The underground level (Level Zero) contains the environmental control & life-support system + stowage and is not inhabited. Level Four on the "top floor" is dedicated to crew support, such as health maintenance and recreation facilities. The intermediate Levels 1,2 & 3 contain the crew quarters (including personal hygience facilities), base operations (=surface operations workstations, data & communications center, base activities wardroom, landing operations center, libraries and waste management facilities) and mission operations facilities (=lunar experiment laboratory, scientific data processing & maintenance facilities). 550KW nuclear reactor. The lunar outpost power capability is augmented substantially in 2008 as surface operations expand to a range of several hundred kilometers from the base. The permanent crew simulates a complete 3-year Mars mission using the outpost and Space Station Freedom, e.g. to determine the effect of zero/low gravity on humans. 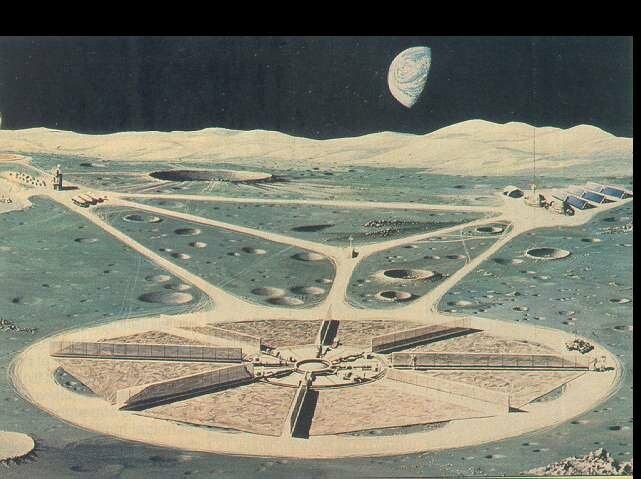 Large-scale lunar mining and oxygen production plant. 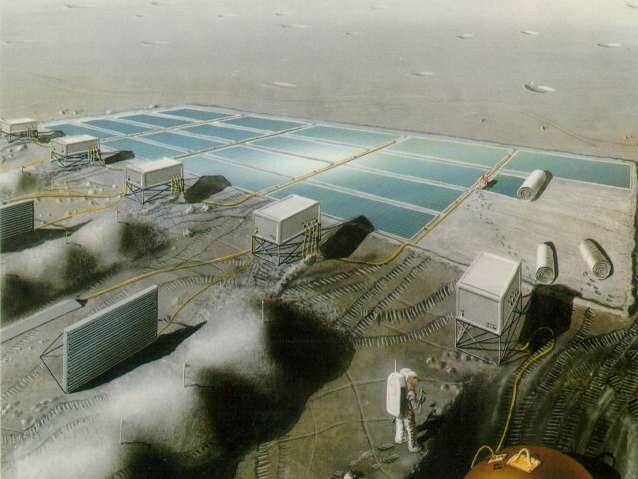 The 2002 experimental lunar oxygen (LUNOX) facility would prove different mining and extraction techniques but its maximum output would only be a few tons of LUNOX per month. 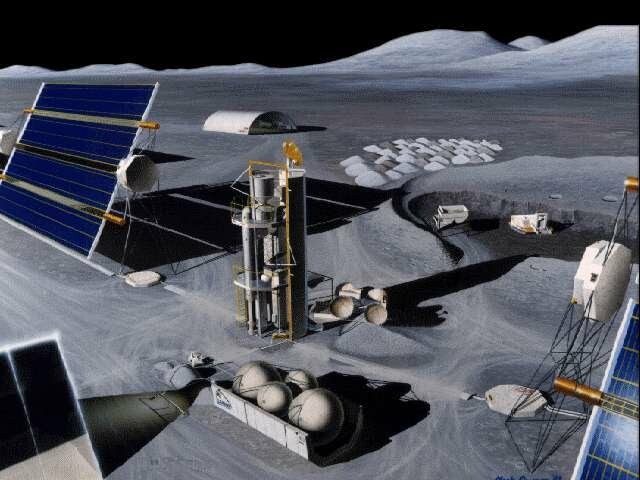 In 2010, a larger facility would be emplaced to produce 60 tonnes of LUNOX for the Lunar Excursion Vehicles, lunar surface transportation and portable power/life support needs. All this substantially reduces the transportation requirement from Earth since in-situ resources can be used. Similar techniques will later be used on Mars.